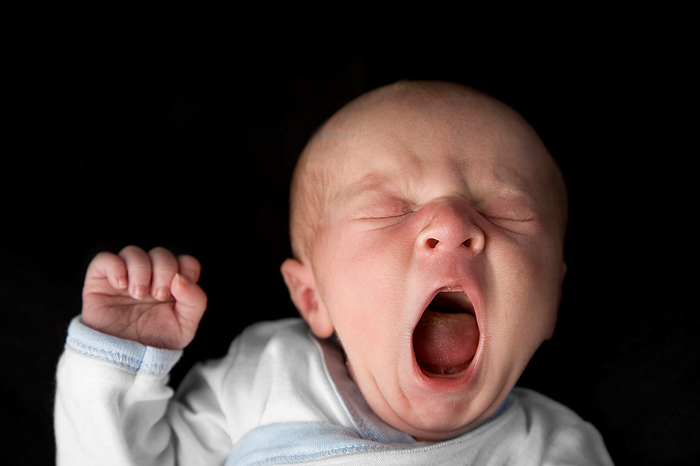 About half of adults yawn when someone else yawns in a phenomenon known as contagious yawning. But children with severe autism appear to miss the subtle clues that might prompt them to yawn when others do so, according to a new University of Connecticut study that could help researchers better understand why individuals with autism have difficulty forming close emotional bonds with others. The study, which appeared online Sept. 14 in the journal Child Development, also found that children with less severe autistic symptoms, those diagnosed with milder variants of autism spectrum disorders, were more likely to yawn contagiously than children with severe autism; and that contagious yawning doesn’t appear in most typically developing children until they are about four years old. Contagious yawning is different from spontaneous yawning, which has been recorded in infants in the womb and is seen in all vertebrates. Contagious yawning is a form of mimicry that is unique to chimpanzees and humans and something that is believed to be acquired over time. Previous studies involving contagious yawning first identified it in typically developing children as young as two (Jean Piaget) and some (Anderson & Meno) as late as age five. But Helt’s study is groundbreaking in that it involved children directly interacting with a live stimulus (human experimenters) as opposed to being shown videos of people yawning; and it compared children with both severe autism and those diagnosed with Pervasive Development Disorder, Not Otherwise Specified, a milder variant of autism, against control groups of typically developing children. Helt’s study was divided into two parts. The first study looked at 120 typically developing children between the ages of one and six who were recruited from local daycare centers. The children were placed in a quiet room and seated across from the experimenter. The experimenter than read aloud one to four stories (depending on the children’s age) for a total reading time of 12 minutes. During the last 10 minutes of reading, the experimenter paused to yawn four times and discreetly recorded whether the child yawned within 90 seconds of the yawning stimulus. Approximately 40 percent of the reading sessions were randomly videotaped and coded by two independent raters for reliability. A child was considered to be a contagious yawner if he or she yawned in response to at least one of the experimenter’s yawns. Children who weren’t looking most of the time when the experimenter yawned were excluded from analysis. Helt found that the children under age four were much less likely to be susceptible to contagious yawning than their older peers. None of the 20 one-year-olds in the study yawned; only one in 20 two-year-olds yawned; and two three-year-olds. But children four years old and older yawned much more often (seven out of 20 for four-year-olds, and eight out of 20 for five- and six-year-olds). The second study involved 28 children between the ages of six and 15 with autism spectrum disorders and two control groups of typically developing children of similar age. All of the children participated in a test identical to the first study and all of the interactions were videotaped. Helt found that children diagnosed with autism spectrum disorders yawned about half as often as typically developing children, and none of the children with severe autism showed contagious yawning. She says the findings appear to show that children with autism may be impeded by a deficit in early social learning that impacts their ability to mimic the actions and emotions of others. Besides suggesting a potential identifier for children with autism, Helt believes the findings may help experts develop approaches to working with children with autism spectrum disorders so that they focus more on social and emotional cues.